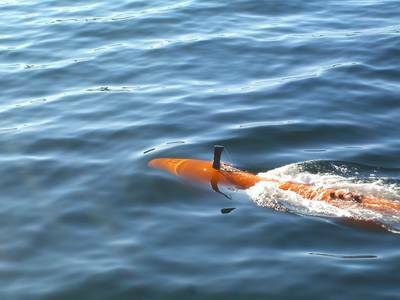 Bergen based Swire Seabed has ordered its first autonomous underwater vehicle (AUV), a HUGIN system configured for commercial survey applications from manufacturer Kongsberg Maritime, the firm announced Thursday. According to Swire Seabed, the purchase is part of an ongoing drive to develop a fully-automated inspection and survey solution for various mission profiles. In October 2018, Swire Seabed completed its first commercial autonomous inspection of offshore pipeline systems for Equinor using Kongsberg Maritime’s HUGIN AUV and, shortly after in December 2018, was awarded a frame agreement with Equinor for provision of offshore survey services. Now, the firm will have a HUGIN AUV of its own. Due for delivery in 2020, the vehicle will be rated to 4,500 meters and equipped with Kongsberg Maritime’s HISAS 1032 synthetic aperture sonar (SAS) and EM2040 multibeam echosounder, as well as a CathX Ocean 48.5-degree field of view still image color camera and laser profiler, a sub-bottom profiler, magnetometer and turbidity sensor. The vehicle will also make use of Kongsberg’s automatic pipeline tracking solution, which utilizes the SAS or multibeam echo sounder to track alongside or above a pipeline, to conduct survey and inspection tasks. Flexible and self-contained, the AUV will measure approximately 5.2 meters in length, with a diameter of 0.875 meters, and have high endurance with all sensors operating. 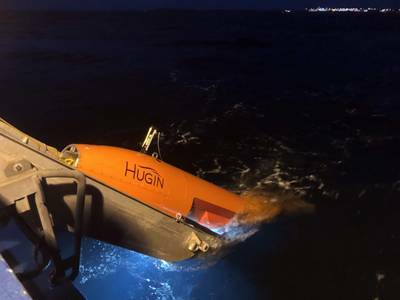 The containerized HUGIN AUV system is designed for simple mobilization, and everything for day-to-day operations is installed in an ‘AUV van’ including the launch and recovery system (LARS). The Swire Seabed HUGIN includes a new LARS designed and manufactured by Kongsberg Evotec for high sea state and high freeboard operation of AUVs.